Nursing kittens need formula if mom isn't around. 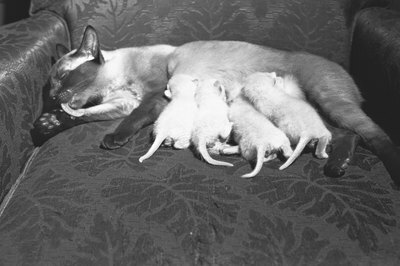 Kittens younger than 4 or 5 weeks need their mother's milk to thrive. If you find young kittens that have been abandoned or whose mom isn't able to nurse them, you'll need to bottle-feed them formula yourself. Kittens need a kitten milk replacement specifically formulated to contain the proper balance of proteins and nutrients they need to support healthy growth. But not everybody keeps such a product in the pantry. Suppose you find orphaned kittens after all the pet stores in your area have closed. You can mix up an emergency formula to feed the little ones for a short period. Such formulas, usually made with ingredients you may have in your home, won't upset your fuzzy friends' tummies when you feed them, overcoming the risk of problems like diarrhea. Most emergency formulas are not nutritionally balanced for a kitten, so you should feed your kittens emergency formula for only as long as it takes you to get some kitten milk replacement formula -- hopefully no more than 24 hours. Mix 1 ounce each of condensed milk, water and plain yogurt with an egg yolk to make a quick and easy emergency formula with common pantry items. Warm this formula for a minute in the microwave and allow it to cool until it is feels comfortable when you place a drop or two on the inside of your wrist; don't serve the formula too hot, as it could burn your little one. When feeding your little kitten emergency formula, it would be ideal to do so from a kitten nursing bottle. Unfortunately, if you are in a situation where you don't have one handy and can't obtain one, an eye dropper can do in a pinch. You can also use a syringe without a needle to drop the formula into the little one's mouth a drop or two at a time. Remember to keep the kitty on his tummy while you feed him. Feed the kitty approximately 8cc or 1/4 ounce of formula per ounce of his weight every 24 hours. Divide this amount into eight to 10 feedings spaced two to three hours apart. Get an idea of his weight by placing him on a kitchen or postal scale. If you're unsure what to feed your little one, consider feeding the kitty some goat's milk. Goat's milk has less lactose than cow milk. Whole cow's milk isn't the best idea for nursing kittens because they are lactose intolerant; diarrhea's a likely result. If this is what you have around, though, mix 8 ounces of it with two egg yolks and a teaspoon of vegetable oil to make a tolerable emergency formula for your little one. Depending on what you have in your pantry or can find in a grocery store open late, you can even use human infant formula as a substitute for kitten formula. Use this until you can get to your vet or a pet store for the real deal. What Do Veterinarians Say About Cats Drinking Cow's Milk or Cream? 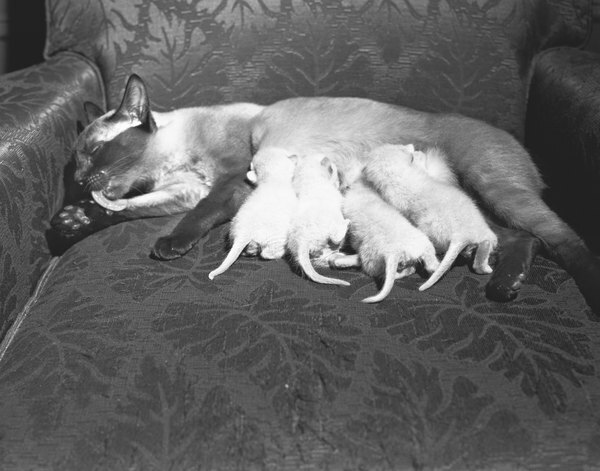 Will Milk Replacement for Puppies Work for Cats?